It is hard to believe we are already over halfway through first term for the 2018 school year! Before any more of the year gets away, it is important that I fill you in on the area of Student Wellbeing at Mordialloc College. At Mordialloc College we place a strong emphasis on ensuring students are happy and feeling connected to the College. Evidence tells us that students who are happy and feel a sense of connectedness to school are better placed to be able to achieve their personal best at school. For the new families that have joined us this year let me introduce you to the Wellbeing Team. Lana Paten is the School Chaplain working 3 days and Ann Marsh is our Secondary School Nurse joining us 2 days a week. I work 5 days in the Wellbeing Team. As a Wellbeing Team we have been busy during this start to the new year facilitating a range of activities to support student wellbeing. We always enjoy having a function to welcome new students to the College. 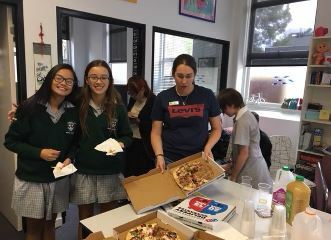 Last week we hosted a new students lunch and enjoyed some good conversations and pizzas together. The Yr 10 Peer Support Leaders have been trained and are ready to put their training into practice. They were linked to their Yr 7 Home Groups last week to deliver a number of fun activities. The Peer Support program provides great opportunities for the Yr 7s to build links with the Senior Yr 10 students. From all the laughs and activity observed it appeared all students were greatly enjoying the program. The Yr 10 Peer Support Leaders will continue to meet with the Yr 7 Home Groups to run activities during the year. The Breakfast Group continues to run this year on Thursday mornings. This is another great opportunity for students to meet with other students within and outside their own year level. All students are welcome to come along and share in breakfast together, a great way to start the school day! In addition to the Wellbeing Team we are also very fortunate to have support of some other organisations. We greatly appreciate the wonderful partnership we have with KYS (Kingston Youth Services). Janet from KYS can be seen helping out at many of the wellbeing events across the college. This also provides a great opportunity for students to link in with the great services KYS offer for young people in Kingston. As a focus of ensuring the Yr 7s are feeling connected to the College, Janet facilitates a Yr 7 Friday Frenzy lunchtime group. We also greatly value the work of Kathy from Engage 1on1 Psychological Services, offering counselling support to students as requested. A Mental Health Care Plan obtained from your GP as a referral is required to access this service. Please feel free to contact me to discuss further the many supports we have available to strengthen student wellbeing.